Laila Rizvi The Health Foundation, Sharah-e-Faisal. Karachi, Pakistan. Saad Khalid Niaz The Health Foundation, Sharah-e-Faisal. Karachi, Pakistan & Dow University of Health Sciences, Karachi Pakistan. Nighat Nisar Dow University of Health Sciences, Karachi Pakistan. Background: Hepatitis B virus (HBV) is considered as the smallest human DNA virus known to the world at present. Concerning the primary level of prevention against hepatitis B, health services utilization of community residents is essential to their health seeking behavior. 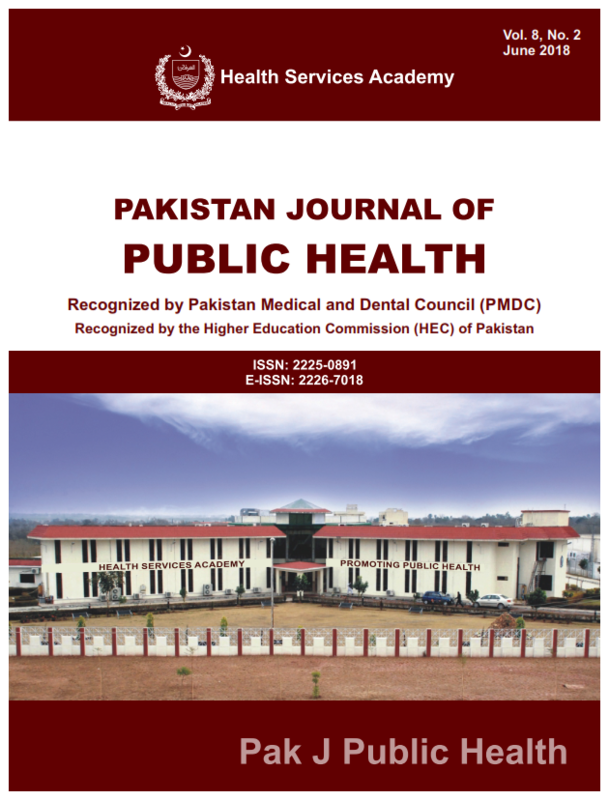 This community-based study was designed to determine health services utilization regarding hepatitis B among residents of Korangi, Karachi. Methods: A cross-sectional study design and multi-stage random sampling technique was used. Data was entered and analyzed in SPSS version-21. Sample size calculated at 95% CI with 5% absolute precision was 286 households. Data of 293 study respondents were entered for analysis after obtaining an informed consent. All participants were assured of their privacy and confidentiality to be protected. A pre-tested study questionnaire containing two main parts was administered to the study respondents. Results: The results of our survey have elucidated that the residents of Korangi, Karachi were adherent to utilize health services regarding hepatitis B which mainly included vaccination. A majority of the study participants reported to have their children vaccinated against hepatitis B at their schools. Whereas, no significant association was observed for other covariates with health services utilization regarding hepatitis B. Conclusion: The findings of this survey have generally found that health services utilization regarding hepatitis B was known to the community residents which can be attributed to better awareness. However, importance of screening and uptake of vaccination against hepatitis B must be raised so as to reduce prevalence of disease in the community.